I-87018ZW-G/S | 10-channel Analog and Thermocouple Input Module with High Over Voltage Protection. Supports +/- 15mV, +/- 50mV, +/- 100mV, +/- 500mV, +/- 1V, +/- 2.5V +/-20mA, 0~20mA, 4~20mA (Requires Optional External 125 Ohm Resistor) Input types. Supports operating temperature from -25 to 75 °C (-13F ~ 167F). 10-channel Analog and Thermocouple Input Module with High Over Voltage Protection. Supports +/- 15mV, +/- 50mV, +/- 100mV, +/- 500mV, +/- 1V, +/- 2.5V +/-20mA, 0~20mA, 4~20mA (Requires Optional External 125 Ohm Resistor) Input types. Supports operating temperature from -25 to 75 °C (-13F ~ 167F). 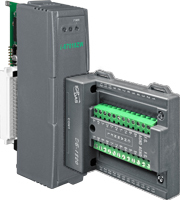 I-87018ZW-G/S is a 10-channel Analog and Thermocouple Input Module with High Over Voltage Protection. I-87018ZW-G/S can connect DB-1820 data boards both directly and through CD-2518D kit. It supports +/- 15mV, +/- 50mV, +/- 100mV, +/- 500mV, +/- 1V, +/- 2.5V, +/-20mA, 0~20mA, and 4~20mA (Requires Optional External 125 Ohm Resistor) Input types. Supports J, K, T, E, R, S, B, N, C, L, M, and LDIN43710 Thermocouple types.